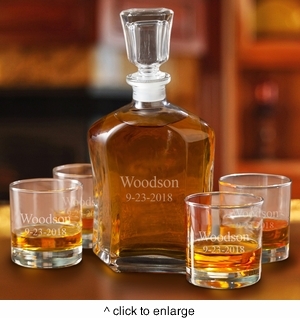 Lend your bar a touch of elegance with this personalized Decanter set including 4 low ball glasses. This beautiful decanter is made of heavy glass and allows for 23 ounces of liquid. The low ball glasses hold 8 ounces each with a matching personalization as the decanter. The lowball dimensions are 3” W x 3 1/2” H and hold 8 oz. PERSONALIZATION: Personalize with 2 lines up to 15 characters per line, 3 initials in the order of (First, Middle, Last), or with our Stamped, Modern, Circle or Antler design - all allowing 1 line up to 15 characters of personalization.